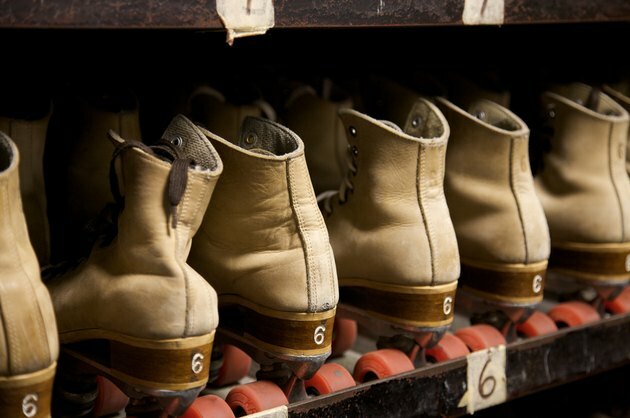 Less expensive than an average trip to the movies, the roller rink offers something many other entertainment venues do not -- a healthy workout. The Franklin Institute lists roller skating among its recommended forms of aerobic activity. Yet roller skating doesn’t feel like exercise when roller rink games are enjoyed with friends. Whether you're celebrating a birthday or spending leisure time with a group, play roller skating games the next time you gather at the rink. Use chalk to draw large circles, numbered one through 12, on the floor of the rink. Instruct players to skate around the rink as music plays. Stop the music at random intervals. When the music stops, players skate into the nearest circle. Roll a set of giant, fuzzy dice on the middle of the roller rink floor. The players in the circle who match the number are out of the game. Play continues until one player remains. A variation gives eliminated players the opportunity to remain in the game. The skaters in the elimination circle must perform commands such as "skate backward” or “skate on one foot” to stay on the rink. Skaters who fail to complete a command are out of the game. Take the classic party game of freeze dance to the skating rink. In this version, players skate rather than dance as the music plays. Each time the music stops, so do the skaters. The last player to stop on her skates must retreat to the sideline. At the start of the game, assign two or three players as referees to watch and determine which players are last to freeze. Rotate eliminated players with the referees so everyone gets a chance to play. Play this game with empty pizza boxes, cardboard boxes or soft, stackable objects. Divide skaters into two teams. Designate a skating lane for each team. Use cones to separate the lanes and tape to mark the start and finish line. Give the first skater on each team a stack of five pizza boxes. At the sound of the start signal, the skaters race around the rink while carrying the boxes. If a player drops a box, he must return to the start line and try again. Once he completes the lap, he hands the boxes to the second skater in line. The relay continues in this manner until one team is the first to have all its members carry their boxes across the finish line. Write the names of roller rink locations on index cards. Suggestions for places include under the disco ball, left of the exit sign and next to the DJ booth. Place the cards in a hat. Players skate around the rink and stop where they are when the DJ stops the music. The DJ pulls a card from the hat and the skater closest to the location wins a prize. Simple prize ideas include a candy bar, lollipop, stickers or glow-in-the-dark bracelets. Family Corner: Roller Skating: A Less Expensive Birthday Bash!